The new proposed "public" building with apartments above situated between Hotel Montana and the Gondola Station - The artists impression is from the main road making things look quite built up as you approach the resort from Le Praz. The creche, commune office plus a medical room & small left luggage place are planned. Met up with Jean-Pierre Lalanne the Commercial Director of the lift company S3V (the company that runs Courchevel, La Tania and Méribel Mottaret areas) at the Ski Show - he confirmed that the new piste mentioned below will help cut out the occasional Biollay bottleneck with a direct route from Verdons to the top of the Jardin L'Alpin gondola. There will be some extra traffic due to the new "fun area" snow park being developed below Verdons but the alternative route to the Pralong 6-man chair should take away plenty of traffic. Ultimately they may want to upgrade Biollay to a 6-man however. Well done to Nick Ski for spotting this in the Summer! 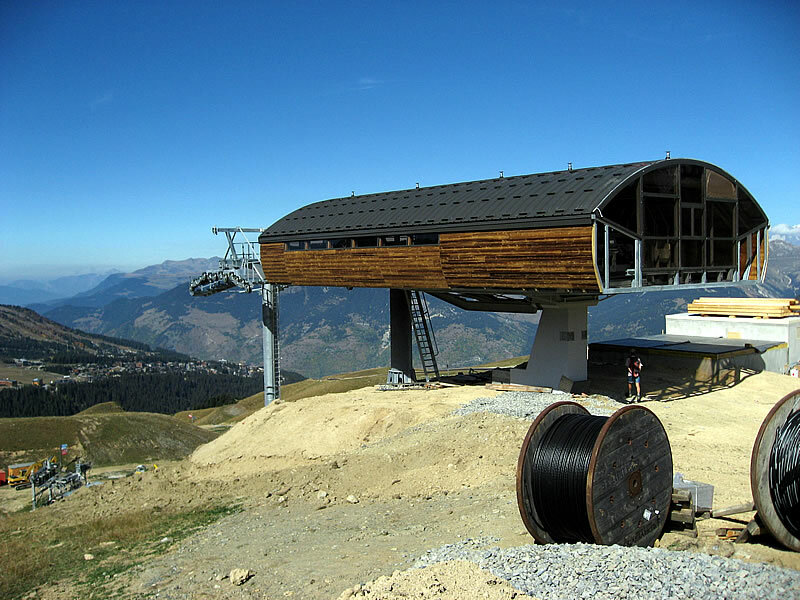 Jean-Pierre also mentioned that the original plan for the new Roc Mugnier chair was for it to be extended right up to the top of the Signal Chair - he said the local village/commune/.Mairie put the block on that though so it's in a similar place just short of the snow cannon reservoir - see pics below. 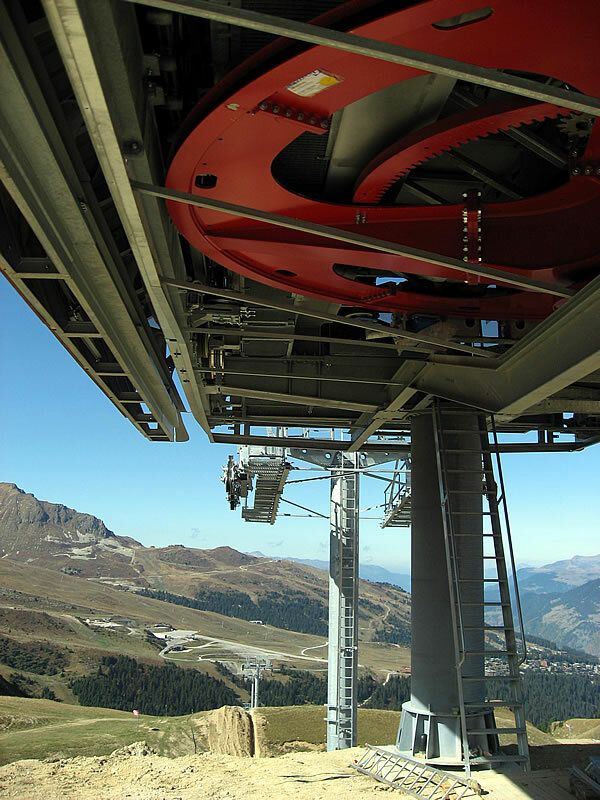 We also were told that a "mini-pass" in La Tania for beginners to use the Gondola without having to pay for a full Courchevel Pass is to be launched this Winter. Prices are still to be confirmed but should be significantly cheaper than buying a whole valley pass (Currently one trip up the Gondola can be purchased for 6€). The new Three Valley Piste Map will be out in November. Confirmation that all the new beginners lifts around Val Thorens are "High Speed" (less than 2m/s compared to fast drags of 15m/s) covered Magic Carpets - a downwards one to access the big beginners area too. 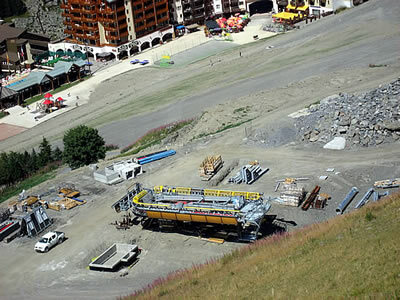 Also confirmation that the Altiport Drag in Méribel is not being removed - the beginning is being moved up the hill a bit to create more space around the arrival station of the new Méribel Village chair and the 8-man chair area. 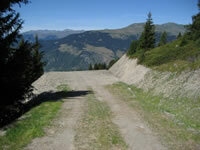 The drag is being upgraded too in this other excellent beginners area in the Three Valleys. 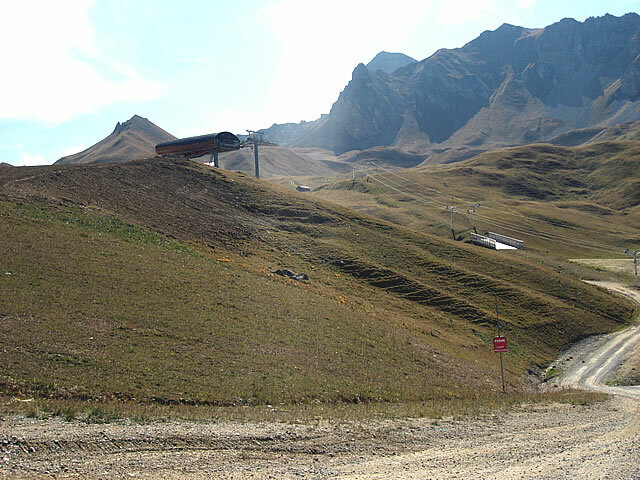 Finally no confirmation on the free bus links / frequency to Méribel yet. Thanks to Jean-Pierre from S3V and Nico & Arnaud from the La Tania Tourist Office for sharing the information. 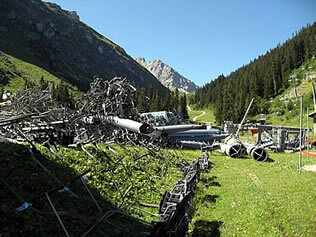 A brand new high speed 6-pack chair is going in to improve access from the Courchevel 1850 area to the skiing above 1650. 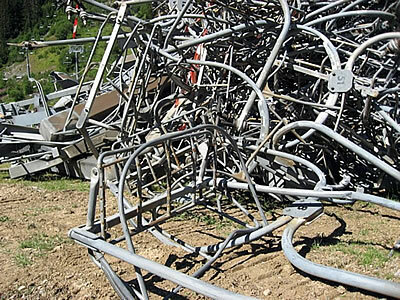 This will replace the old slow Roc Mugnier and Praméruel chair lifts (see pics below) plus the Combe drag lift may be replaced eventually if they extend a new chair from this area up to the Signal area (but see update above). Trips to La Boulette (aka Katie's) in 1650 for lunch and après ski sessions will now be a lot quicker! 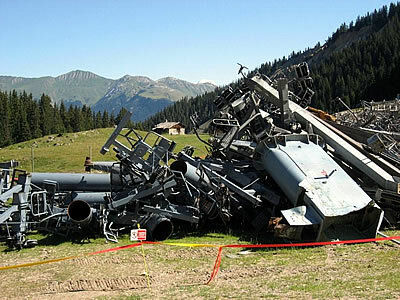 The remains of the old Roc Mugnier and Praméruel lifts - looks like these ones are not being re-used or sent to Eastern Europe... Top right is a guess of where the new lift is going. The new Méribel Village Golf chair will half the travel time up to the Méribel Altiport where it connects with the 8-man Altiport Chair or you can ski straight to Méribel Centre (with a little help from the rope tow if you like). 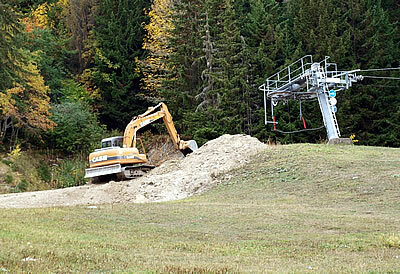 In Les Menuires a new 6 man chair is going in near to Bruyeres this replaces the old Reberty and Etele chairs. 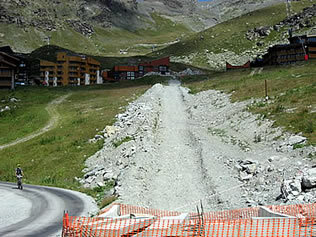 This should allow another quick way out of the valley giving a link to the Beca chair and over towards Mottaret. In Val Thorens the double drag lift back into resort has been removed, looks like a series of covered moving belt arrangement / travelator lifts are to replace this to allow easier access back to resort for beginners from the learner area nearby. Additional travelators are also being installed. The new beginners lift replacing the drags in Val Thorens - there's another one of these tunnels going in below this too. Thanks to Val Thorens Tourist Office for the pic. 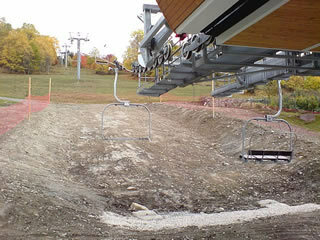 An extension of the Cospillot draglift (below the Pralong Chair) is being made. This is to allow access from more (very expensive) chalets along this picture post card run down to 1550. 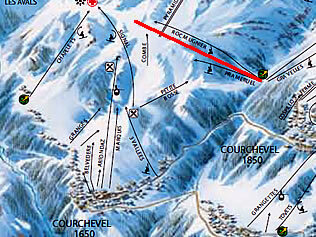 The Cospillot draglift on the top left of the piste map - See the full Three Valleys map for more detail. 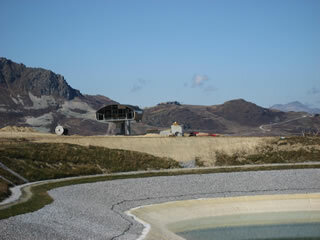 A new 3 hour single valley lift pass is to be launched for Winter 2009/2010. The 3 consecutive hours are activated the first time the skier goes through a turnstile. This pass will answer the demand of skiers who want to ski when they like without being restricted to the 1/2 day pass times (like getting out of bed early). The 1/2 day morning pass will be discontinued except for the 3 Vallées ski area while the 1/2 day afternoon pass (from 12h30) will be maintained. 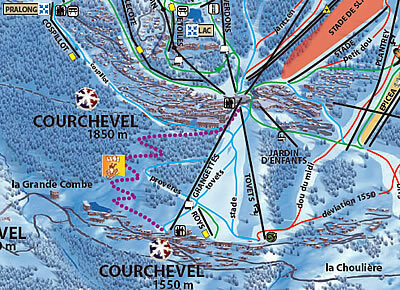 The integration of Courchevel 1650 into the Minipass. For 1650 visitors there was only the free Mickey and Belvédère draglifts on the Minipass. 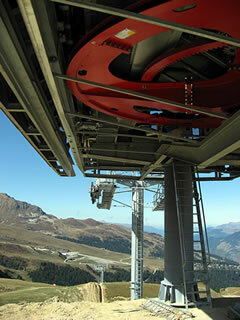 From next season, the Minipass will include the Ariondaz télécabine and Petite Bosse draglift. Morning only passes are available for Three Valleys (09:30-12:30 €37.50) or the three hour local pass (€32). 1-Day Courchevel €39 (from 38), 6-Day Courchevel €190 (from €182) and 6-Day Three Valleys €232 (from €225). Some major piste work on Murettes down to Le Praz is going ahead, possibly there are some more new snow cannons being installed and an easier route down to the village is being planned. 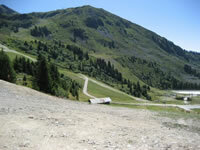 This piste connects to the bottom of the classic black Jockeys route down from the top of the La Tania gondola. This area catches more of the sun and is the first area on the run to start losing snow. The Plantrey Snow Park is being moved to the Dunes and Canyons zone underneath the Verdons telecabine so as to create a larger entertainment area, which will be both more varied and visible. The idea of the project (to be completed over several years), is to better exploit the space between the Verdons and Renard pistes by regrouping complementary activities such as: hoops, boarder, jumps, Avalanch'Camp, and other entertainment ideas. 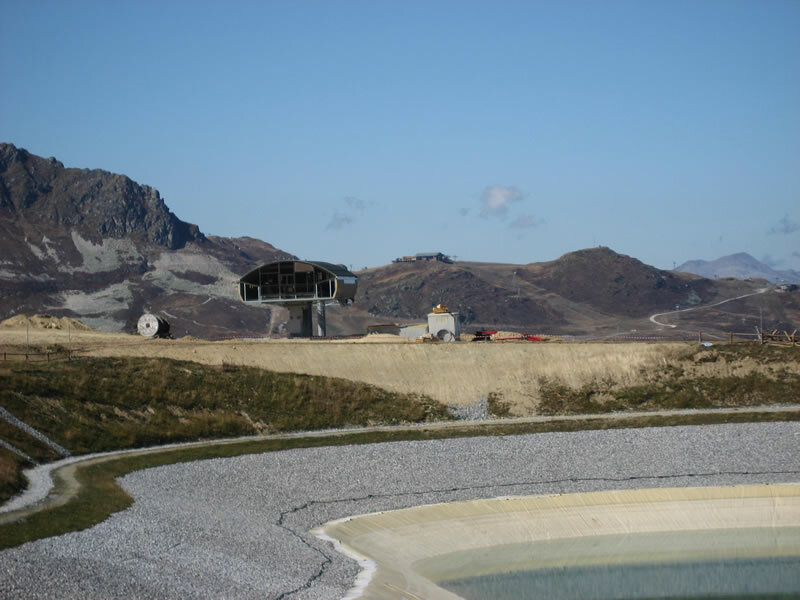 As part of this work it looks like access to the Pralong area may be be available without using the Biollay chair which can become a bottleneck at peak times during the high season. Redevelopment of the Sittelle piste to make the start of this piste more accessible so as to alleviate the flow of skiers through the Rossignol ZEN* making it more of a through route. Improvement of the signs and directions for the Snowpark des Plattières to highlight the visibility of the entry gates. 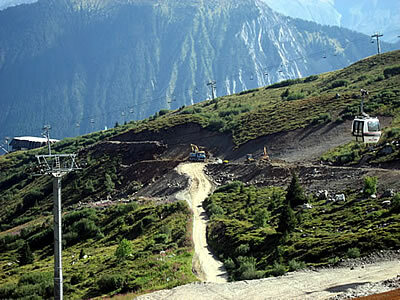 Also the 2.5 hectares of the Snowpark will be upgraded and the access to the Pipe XXL at the summit will be improved. 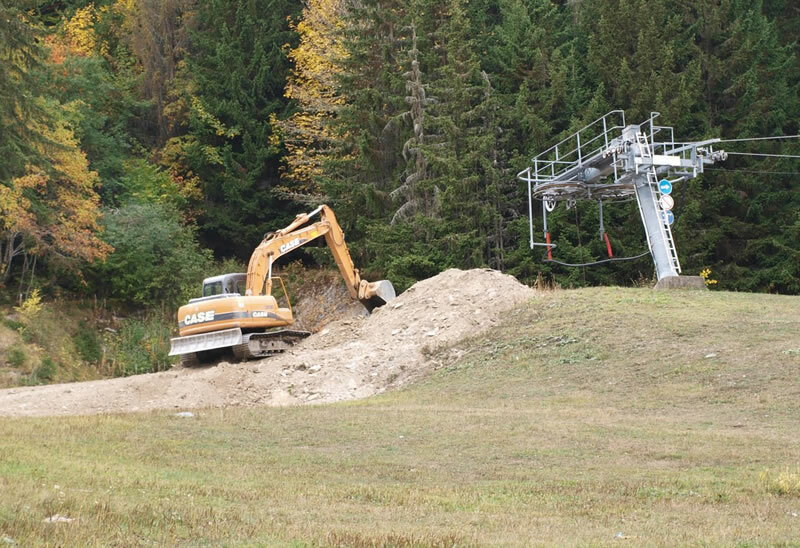 The snow cannons on the Aigle piste and on the Plattières Area are to be replaced by newer versions with improved energy consumption and lower noise levels. New avalanche release systems to allow faster securing of the Combe des Plattières area and therefore faster opening of the 3 Vallées link after heavy snowfalls. Down in Méribel the Liévre piste has been improved and re-shaped for easier access down to La Chaudanne area from the Moon Park side of the hill - this can often can be icy in late afternoon or a slush-fest at the end of season, so a welcome improvement. As well as the many chalets being built and re-developed especially around 1850 it doesn't looks like work has started on the buildings between Hotel Montana and The Gondola yet. There are some new chalets under construction in La Tania near to the red run down in to resort however plus another new one springing up behind the Ski Lodge. Announcing Snow Retreat, Trois Vallees IT, SeasonHair.com, - more here plus New Generation Ski School and skivo2.com will be operating in La Tania for Winter 2009/2010. Hotel Telemark is no longer operating, the sale of the business (Fonds de Commerce) is going to be put up for auction. Anyone interested needs to contact Jean Blanchard on +33 (0)479 322 094 or email george@hoteltelemark.com for further information The flexible stay options, bistro menu and bar near the chalets were a real boon to La Tania - some great people have worked there over the years, let's hope someone takes this on next season. Easier exit at the top of the free beginners Troika lift in the centre of resort has been made. 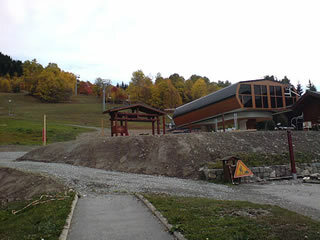 The piste levelled off and the trees removed. Easier access from the green run link over to Folyeres has been made as well to improve access down to resort for beginners. This beginners blue run down from the top of the mountain towards the top of the gondola station has been widened, re-aligned and re-shaped in places to make it much easier for beginners. More on this here and thanks to our new ESF Directeur Manchu for the pics. 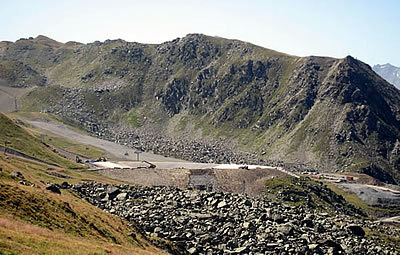 Above St Martin De Belleville a large reservoir has been built for the snow canons near to the Granges chairlift. The tree in the centre of La Troika has been removed along with some at the top of the drag lift - no idea why, seems a shame. VAT reduction in restaurants across France from 19.6% to 5.5% - a significant cut but it's food only, doesn't include alcohol. 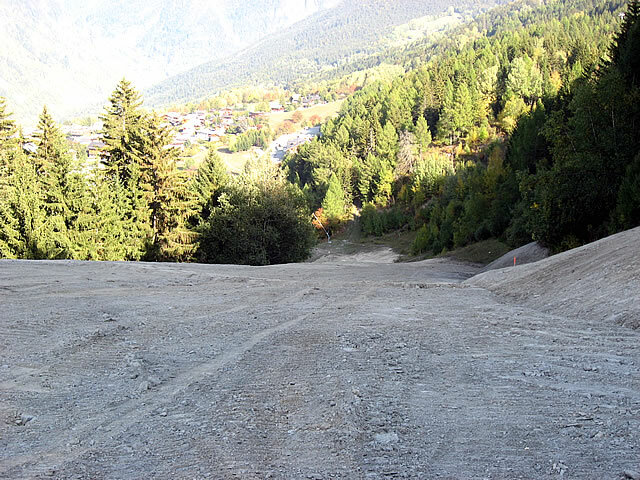 There a new speed ramp in Le Praz - may be Summer only though. Champion (previously Provencia) is now Carrefour in Moûtiers (and everywhere else). The Magnestick safety device vest/backpack to "stick" kids to certain chairlifts will be available to anyone for hire next season - not just those in lessons. Could be some home made sausages from Bring Your Sisters Sound Tech Joey on sale next season if he gets his act together. 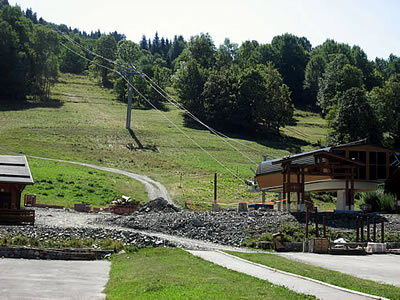 8 new chalets are going up in La Tania near the red run plus a new one on the bank at the back of the Ski Lodge. New toilets are being designed / planned for the Ski Lodge, there's a possibility of Magners on draught next season and a number of returning Staff too. ESF running a ski taxi service for non-skiers next season allowing them to experience the mountains (and the restaurants). Neptune Internet Services continue to roll out Internet WiFi across the Three Valleys - access from lots of places from 5€ an hour but daily and weekly deals available. New boutique hotel L’Hélios by the Doron Pub is due to open - very top end suite only job complete with Spa. The La Tania Tourist Office is to revamp it's website (let's hope it's not all video, music & flash graphics but more about content) along with more marketing targeting the UK. They'll be present at The Three Valleys area at the London Ski Show which includes The Three Valleys Bar and La Tania is already being advertised in the easyJet in-flight magazine. The official La Tania Winter Brochure for 2009/2010 is now available - It's in PDF format and it's a 7.2Mb download. Pictures of locals Tim, Mini, Ania, Bruno, Kirsty, Jeremy, Mutzig Dave & Sister Rich amongst others! BYS should be Sunday nights at La Taiga, Tuesdays at The Ski Lodge and Thursdays at Lodge du Village over in Méribel Village. Probably Wednesday and/or Friday Aprés Ski Happy Hours at The Ski Lodge too. The fantastic Ska Wars look like returning - probably around over Christmas / New Year time and expect to see some more gigs from instructor Sam Burrows too - he's been gigging quite a bit around the North West this Summer. The return of the Freeride competition on the Rocher de la Loze above La Tania, above the Col de la Loze (aka Plumbers Crack) is planned. The Valkyrie Festival takes place on 6 - 7 March 2010 and is going to be sponsored by La Tania. An excellent spectator event with some really mad skiing down these steep couloirs - usually anyone with a helmet and back protector can register to have a go, but it is a 40 minutes to an hour hike up to the summit start area. The Altitude Festival returns for the third time to Méribel from 20 - 26 March 2010 with a bigger and better line up promised. There'll be the annual latania.co.uk locals photo shoot and a 10th Birthday Party in mid-December at the Ski Lodge - stay tuned. The massive La Tania Charity Day is set for Wednesday 14 April 2010 - a highlight of the season, with BBQs, fancy dress, live music, outdoor bar, fun & games plus the float procession down La Troika, please support us if you can. Flights / Airports / Travel etc. Halifax Easycash account issues Visa Electron cards which have no charges with Ryanair and easyJet. Ryanair charge an amazing £5 per person per flight even for Visa Debit Cards - a party of 10 are charged £100 card processing fee for return flights! Some people are still getting charged for the hire car shuttle bus at Geneva Airport - argue or walk (it really is less than 10 minutes). easyJet flight reduction by 20% from Luton and they're pulling out of East Midlands. Bmibaby are expanding some routes to Geneva and flying there in Summer for the first time - but not the daily year round service that easyJet ran. Middle of the day flights too. The Geneva airport passport booths on arrival have moved 75m up the corridor - it's not a huge queue as we thought this Summer! Free Wifi for one hour just about all over Geneva airport - just go through the sign up procedure to get your free hour. The off site car parking bus stops at Luton Airport have moved (further away from the terminal in to the car park drop off area where there's a £1 charge just to drop off (like Birmingham). Three Valley Transfers based in La Tania will be running a shared transfer service from the local airports to Three Valley resorts for Winter 2010 making the journey cheaper. BA are to start charging for ski carriage - although it's per bag so one of those big wheelie ski/board bags with all your stuff in may avoid the extra charges. Ryanair have increased their hold baggage and ski carriage charges again - if a couple just turned up at the airport without pre-booking a hold bag and boot bag each (with only 15kg allowance) plus 2 pairs of skis they'd be charged £320 !!! Free access to lots of UK airport lounges has been re-instated for Diners Card users - there's a lounge in Geneva above the main duty free booze shop too. There's a new Burger King at Geneva Airport above departures at the easyJet end (seems like a permanent queue though - this food court area also has a Starbucks (think WifI), self-service restaurant and a Pizza palce called Le Sud - Pizzas from 20CHF, Coke 4.60CHF. There's an outdoor terrace too. Villages Hotels are now part of the Mercure/Novotel/Etap/Formula 1 group and are going about the re-branding process across France. A popular speed trap on the new Geneva - Annecy road is a mobile camera / unmarked car parked about 3km north of the tunnel. Note 90 and 110km/h stretches on here not 130km/h. A brand new Kentucky Fried Chicken near to the approach to Chambéry Airport should be open for the start of Winter. La Tania lift opening has been confirmed as the 12 December 2009 - It's the 10th Birthday of latania.co.uk so see you all then! 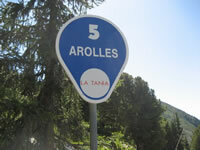 La Tania is now closing on 25 April 2010 (the same as 1850 for 2010, normally we're a week earlier). 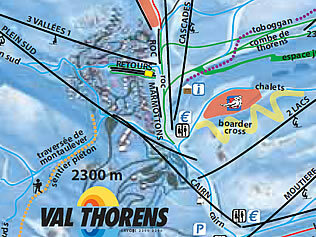 Val Thorens plans to start opening lifts on 21 Nov 2009 to 9 May 2010 (a week later that 2009). 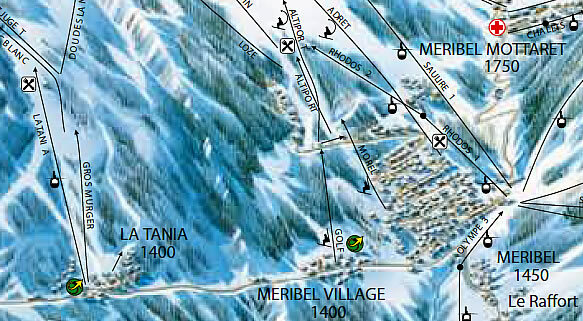 Courchevel 1850 and some main Méribel valley lifts plan to start opening from 5 December 2009 through until 25 April 2010. 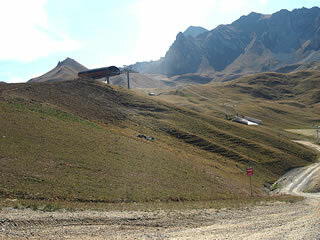 Le Praz (1300), 1550 & 1650 expected 12 Dec 2009 to 25 Apr 2010. Thanks to Nick from Nick Ski plus Andrea from Snow Retreat and Tim from Pub Le Ski Lodge for the photos.